With no identifiable tracks � or limitations � North Texas improvisationalists Ghostcar�s Too Strong/The Art of Transition is a paradox in polycarbonate. Recorded at Denton�s Echo Lab, the c.d. is atmospheric yet driving, structured yet amorphous. Like life, Too Strong/The Art of Transition is more about the journey than the destination. Ghostcar is a band in the best sense of the term � no one instrument ever assumes the lead for too long. 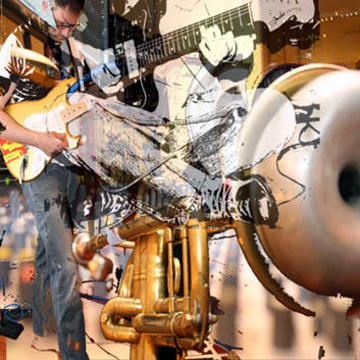 Parts are equally distributed among trumpet, guitar, bass, and drums, plus assorted electronic effects. Bassist Chris Perdue anchors the arkestra, alternating between steady grooves and dives of fantasy. Drummer Clay Stinnett�s stickwork sometimes achieves the fluidity and depth of melody. Guitarist Daniel Huffman channels the exploratory approach of Robert Fripp while also nodding in the direction of straight-ahead players, and trumpeter and de facto bandleader Karl Poetschke brightens or smears the sonic tableaux as seemingly predestined. Echo�s Dave Willingham deserves props for capturing the band�s hallmark brand of nebulous density. While proving to be great adventures in hi-fidelity, the band�s two previous outings, Easter Sunday and Flames of Satisfaction vs. the Flames of Despair, Vol. I, aren�t as lively as Too Strong/The Art of Transition. Then again, not much else is.